There is nothing quite like breathing fresh air, feeling the sun on your face, and taking in the sights, sounds, and smells of nature. But experiencing a disability or an injury can rob you of mobility, and make those things seem out of reach. If you love the outdoors, but are not able to stand or walk for long periods of time, then an outdoor mobility scooter may be the perfect solution to restoring your ability to enjoy all nature has to offer. Of course, seeing what she has to offer sometimes requires leaving the pavement. That is when you want a mobility scooter for off road – one that isn’t stopped by a little grass or gravel. While there are many different brands and models of mobility scooters on the market, most of them are not suitable for off road excursions. They are fine for trips in the mall and parking lot, but are not equipped to handle more challenging terrain. Thankfully, a growing number of scooter manufacturers have produced models that can tackle tougher turf, and take you safely through paths that the lighter weight mobility scooters cannot navigate. To help you find the best outdoor mobility scooter to get you out and about, we’ve searched out the available models, compared features, and listened to feedback from owners. From that research we’ve put together a list of the outdoor scooters that we think are worth a look. F 10 in. R 14 in. To find more details about any specific off-road scooter click the More Details button above, or continue reading for our review of each scooter in turn. As you may guess from the comparison table, there are a wide range of outdoor mobility scooter styles available, and each model has its own strengths. We go over each scooter below to help you find the best match for your mobility challenges. 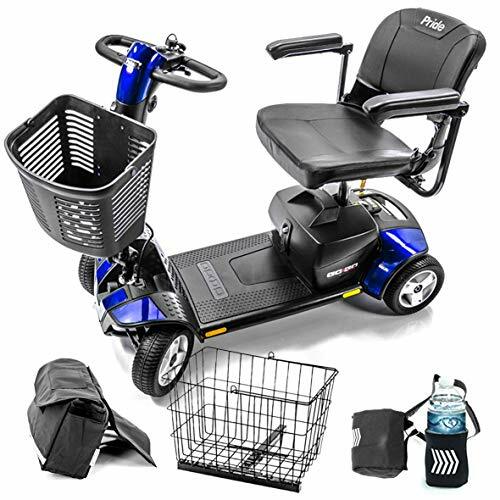 Our top choice for the best outdoor mobility scooter in this review is the Afikim Afiscooter S. Every aspect of the Afiscooter S says quality – from its superior weight capacity (450 pounds), to its exceptional driving range (28 miles on a full battery charge). It truly stands out in almost every way from the other scooters in our roundup. While not a household name in America, Afikim is both a well-known and also very popular scooter company across Europe and in Australia. The benefit of that for US customers is that European scooter safety standards are higher than those in the states. That fact should give you comfort in the quality of the Afiscooter S.
One example of those safety features is the panic sensor. If the driver over squeezes the accelerator on the scooter it will shut off, preventing any mishaps. You then need only to turn it back on in order to reset it. Beyond that, there are a number of high-end features on this scooter. The Afiscooter S has a complete LED lighting package that will dim when the scooter is standing still, preserving battery life. It also boasts an impressive control panel – it is fully illuminated and displays your speed and how many miles you have traveled. Of course, high-end features like this come at a high-end price. The Afikim outdoor mobility scooter is the most expensive unit in our roundup. But if purchasing the Afiscooter S is within you budget there is no need to look any further. It is truly an exceptional scooter. Our second choice for the best outdoor mobility scooter in this review is the BUZZAROUND EX Extreme. While the EX Extreme lacks some of the features of the Afiscooter S it still has a lot to offer, and arguably delivers the most bang for the buck. The EX Extreme is much lighter than our top choice, but still manages to give a very comfortable ride. That is in large part due to its comfort spring suspension system. And while it does have less range than the Afikim – 10 miles less at full charge – the fact it is portable means you can more easily take it to places to ride. Owners of the Buzzaround EX Extreme almost universally love the scooter, with an amazing 94% giving it a 5-star rating on Amazon. Many laud the fact that it comes apart for easy transport, and that it is both stable and comfortable to ride. The other major benefit of the Buzzaround EX Extreme is that it comes at a great price. While we believe the Afikim unit is worth every penny, if you have less pennies to work with, you can get the EX Extreme at less than 1/3 the cost. Our 3rd choice in our roundup of the top mobility scooters for off-road use is the Pride Mobility Go-Go Sport. While the Go-Go Sport is much less an all-terrain unit than the others in our list, it still manages to do fine on grassy and packed paths and doesn’t falter handling inclines. 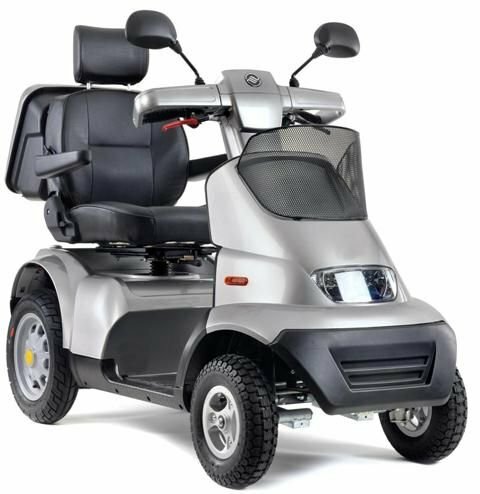 So if your travels don’t take you too far off the beaten path – and if your budget is low – the Pride Mobility Go-Go Sport may be just the ticket. Of course, there are trade offs that justify the lower price of the Go-Go sport. It has a 325-pound weight limit and a cruising range of 14 miles, which are both well off our top choice. But it also offers a level of portability that the Afikim model cannot match. The Go-Go Sport utilize what they call “Feather-touch disassembly”, which allows you to simply separate the frame using only one hand. The entire scooter separates into five pieces that are very lightweight, making it very convenient to transport. Despite the low price there are some other nice touches on the Go-Go Sport – like two sets of colored panels (red and blue) that make it easy to change the look of your scooter. The seat is mounted to the frame of the Pride scooter, giving the rider great stability as they drive. And it features a deck basket to help you transport your purchases if you decide to ride your scooter to and from the store. The other feature going for the Go-Go Plus is it has the lowest price in our group. So if you need a quality outdoor mobility scooter that can handle light-duty off-road work at a bargain, the Pride Mobility Go-Go Sport S74 might be the right choice. WARRANTY: 1-Year Hassle-Free In-Home Service Plan - Included. Lifetime limited warranty on frame 2-year limited warranty on electronics 2-year limited warranty on drive train 6-month limited warranty on batteries. Note: If you want to file a warranty claim on the batteries, you will need to have a valid load test reading showing that the batteries are faulty. Our #4 pick for the best outdoor mobility scooter is the Drive Medical Maverick Executive, and it is distinctly different from the other scooters in our review. For starters it is the only 3-wheeled scooter, but that is not the only difference. The Maverick Executive is flat-out cool. If some of the other scooters in our lineup remind you of a four-wheeler ATV, then the Maverick will strike you as more of a cruising motorbike. It is definitely built to cruise with the longest range in our group – an impressive 35 miles at full charge. And those aren’t necessarily slow miles either. The Maverick has a top speed of nearly 10 miles per hour, which is double that of some of the other units we looked at. But don’t think you will be stuck on some skinny banana seat with the Maverick Executive. 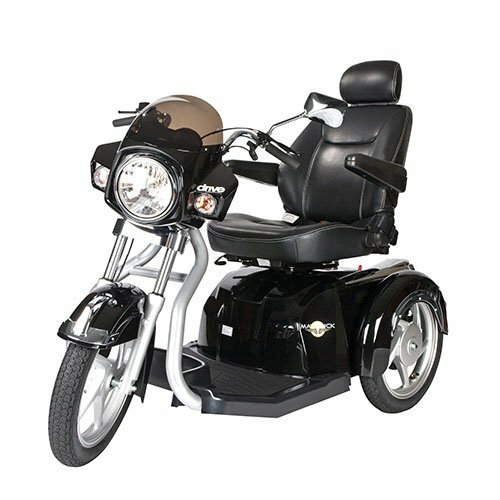 The deluxe captain’s seat on this mobility scooter resembles an executive chair that swivels and comes with an adjustable headrest. Cruising on the Maverick means both style and comfort. If you are looking for a small scooter to navigate around inside the mall or an amusement park, then the Maverick is not for you. But if you have ever wanted to cruise on a motorcycle – or if disability made you think you never could again – this outdoor mobility scooter might be the answer to your prayers. Much like our top choice the Afiscooter S, the Maverick Executive is a very well-made unit. As such, it has a higher price tag then scooters built with lesser components. But in our opinion, the freedom to stylishly cruise that the Maverick Executive from Drive Medical brings is well worth the price. The Victory Sport Pride SC710 DXW is the next outdoor scooter in our roundup. 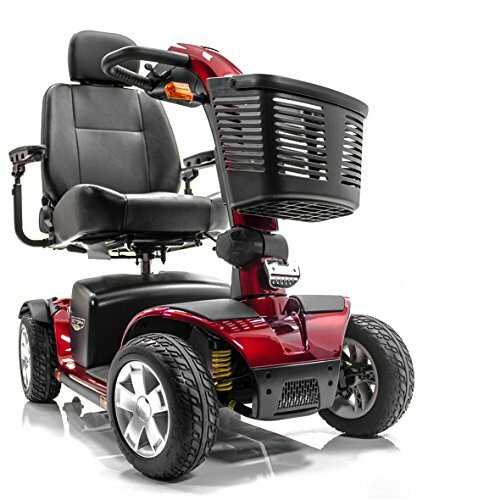 The SC710 is a middle-range option, with a combination of features and price that will be attractive to many people looking for mobility out of doors. The weight capacity of the SC710 is 350 pounds, which puts it squarely in middle of our lineup. The rider is treated to a comfortable high-back seat, and supported by a full suspension (rear single shock and front double shock) that ensures a comfortable ride. It also comes with a one-hand feather-touch disassembly system, making portability both quick and easy. The range of the Victory Sport is 11 miles, which is the shortest in our review. But it has a top speed of 8mph, which is very good at this class of scooter. It comes with 10-inch wheels that offer a smooth ride, but will not scuff indoors. Another attractive feature of the Victory Sport is that the seller – Top Mobility – includes an exclusive 1-year Hassle-Free In-Home Service Plan. While you don’t expect trouble with a new scooter, it is nice to know that if you do have problems they will be taken care of. A survey of online reviews shows that owners of the Victory Sport are overwhelmingly happy with their purchase, mentioning that the scooter is smooth and quiet to drive. And given the attractive price, the Victory Sport SC710 DXW is an excellent choice. Weight capacity 350 lbs. Top Speed 8 mph. Two X 12V 40 AH Batteries included. The final unit in our review of scooters for off-road mobility is the Tzora Titan 4 Hummer XL. The word “Hummer” in the name of this scooter may invoke thoughts of the Humvee, and for good reason. 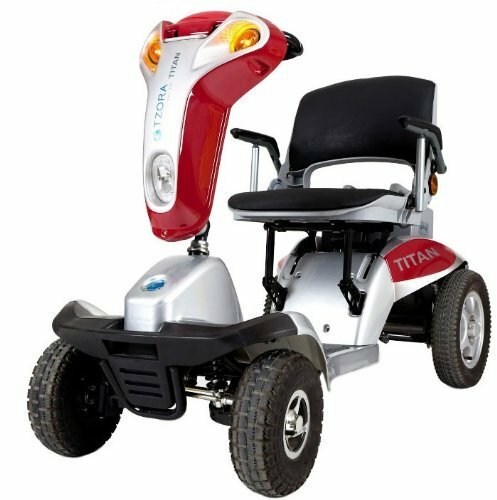 The Titan 4 is probably the most all-terain looking scooter of the bunch. The Titan has a lower weight capacity than the others at 300 pounds, and its 15.5 mile cruising range is in the middle of the pack. But its 6.8mph speed and 18-inch memory foam comfort fit seat are better than average, and come at no additional price. One look at the 14-inch rear tires of the Titan 4 and you will know this is a scooter that is designed to go off-road. The full suspension system ensures you get a very comfortable ride – even when your terrain is rough. And the Hummer-XL is engineered with a special four point seat structure to give you more stability than a typical scooter seat with a center post. That is more important when you travel on uneven ground with a scooter, as it can cause an unstable center of gravity. Which means the Titan 4 is designed to keep you safe as you navigate rougher terrain. A review of online reviews from people who purchased the Hummer XL are mostly positive, with about 80% giving the scooter a 4 or 5-star rating. And in reading them the ones who love it the most are the people taking it off-road to navigate parks, grass, gravel, paths, and hills. They tend to laud the great headlight, improved ability to climb inclines, and the overall power of the Tzora Titan 4. So if you are looking for a mobility scooter for outdoors that is better on rough terrain, the Hummer XL may be just what you need. There are several things to keep in mind when looking for the best all-terrain outdoor electric mobility scooter. Probably one of the most important factors are the wheels on the scooter. Standard rubber tires are fine for mostly indoor use. But for rougher ground foam-filled or solid tires are better, as they allow you to navigate across gravel, grass, and uneven ground. A second factor in a good rugged terrain electric mobility scooter is travel range. To tackle the great outdoors and maximize your enjoyment of nature you will want larger batteries that generate more amps. The more amps your scooter batteries generate the more power you will have to navigate and the longer they will last. While most people searching for the right off road mobility scooter aren’t looking to compete against others on a race track, most are still in a competition. They are competing against whatever disabilities and challenges in their life have limited their abilities to experience the great outdoors to its fullest. We encourage you to do your research, find the right scooter for your needs, and then take action. Life is too short and too precious to let a lack of mobility limit you. 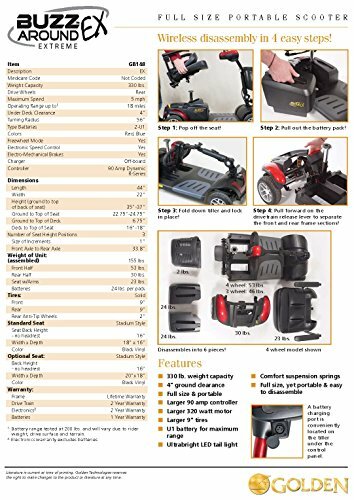 And be sure to check out our review of portable scooter ramps, to help you tackle stairs with your scooter.